Capital! Steampunk is taking Queen Victoria down to the wharf to greet passengers from the Queen Elizabeth, visiting Wellington for the weekend of the 23rd and 24th. This will be a very different way to show off our splendidness and welcome visitors to our lovely city, but because it’s a working port there are rules we have to follow. Everybody wanting to attend must read through CentrePort’s safety induction, answer some questions around the material and provide your name and contact details, with a head-and-shoulders photo, for your ID card (if you’re doing this on a phone or tablet you’ll have the option to take a new photo or upload an existing one). Use Capital! Steampunk for your company and Member for your job title. Please use your real name and don’t be ‘creative’ with the details – CentrePort takes their safety responsibilities very seriously and we need to respect that. Don’t worry about the mentions of high-viz clothing – we’ve made arrangements. It’s an early start so the ship’s passengers get to see Her Majesty (and us) before they head off for their various day trips. We’ll meet at 7.30 in the morning at platform 9, outside the railway station on Waterloo Quay, then drive in convoy down to the wharf entrance by the Interislander terminal. Parking will be on the wharf, and we pick up our passes when we get there. We’ve agreed to stay until around midday, but if you need to slip away early that’s fine. It might pay to bring a snack with you. Her Majesty doesn’t care for rain, so if it’s wet on the day we won’t be going. Each year, the Mount Victoria Historical Society gathers at the top of Mount Victoria to remember Mary Taylor, one of Wellington’s first and most prominent businesswomen. Mary was a friend of Charlotte Brontë, and was known to climb to the top of Mount Victoria to watch for ships bringing Charlotte’s most recent letters from England. The picnic is from 2.30 – 4pm on Sunday 24 March. Come dressed in your finest outdoor dining attire and with something to share for afternoon tea. Friends and family are most welcome. If the weather is unsuitable there’s no alternative day. Strange sounds have been reported coming from the Botanic Gardens – could it be a Snark? Come with Capital! Steampunk’s intrepid group of Snark hunters as we read Lewis Carroll’s wonderful nonsense epic in a gentle stroll down from the top of the Cable Car, followed by a picnic. It’s the Botanic Gardens’ 150th birthday, and Sunday February 3 is Step Back in Time – a family Victorian picnic, featuring performances and activities from 11am until 3pm, focussed mainly on the lower part of the gardens around the soundshell. The Snark hunt will start from the viewing platform beside the top of the Cable Car at midday. We’ll pause at various points along the way to read another exciting section of the poem, but the stroll down to the bottom should take no more than half an hour. The track is sealed all the way and the hunt is suitable for all ages and levels of mobility. Wear your best intrepid explorer outfit! At the conclusion of the hunt we’ll gather in the lower gardens and enjoy a picnic, a chat and a few good old promenades. Exactly where we finish is yet to be confirmed, but probably near the duck pond. One note regarding the picnic … the Gardens are included in the City Council’s liquor ban area, so please stick with non-alcoholic drinks in your picnic basket. The Saturday of Labour Weekend is time for the annual Family Fête at Cobblestones Museum and historic village in Greytown. The fête starts at 11am and finishes at 3pm. We’re all likely to turn up at different times, but we never seem to have any trouble finding each other (now, why might that be?). We don’t have any events planned – just show up, enjoy the displays and food and have a jolly good promenade about in your finery. Come along to the Cross Creek pre-Christmas festival, this year in Featherston’s new town centre – the Squircle. Enjoy the stalls, entertainment, train rides to Clifford Square, swanning opportunities and even a spot of tea duelling. 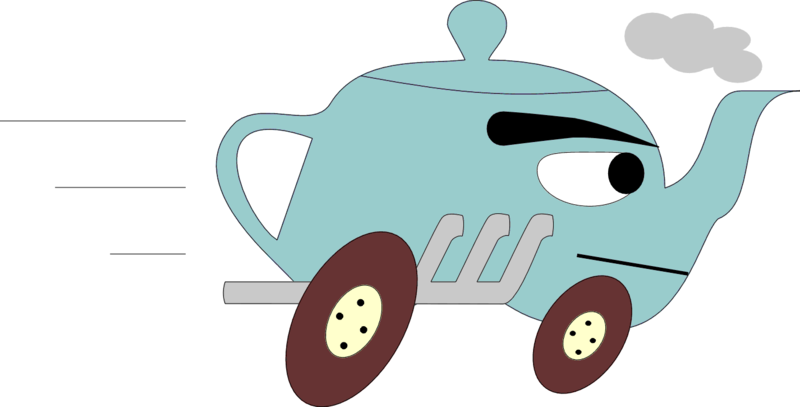 The terrain isn’t really suitable for some of the smaller racing teapots but we’ll have a couple of obstacles along anyway, so bring your teapot if you fancy giving it some exercise. Bring a picnic lunch, or indulge at some of the food stalls. The festival runs from 10am – 3pm on Saturday November 3rd. See you there. For this month’s ‘third Sunday’ Capital! Steampunk gathering, Mrs. Hudson (the younger) will be talking about, and demonstrating the making of, that most useful addition to any wardrobe – spats. Have you got a comfortable pair of shoes that aren’t quite steampunk? Would you like to wear them with more than one outfit but they don’t quite match? Spats are the answer. They’re quick and easy to make, and with two or three pairs in colours to match your outfits, almost any pair of shoes will do. We’ll be meeting in the Newlands Community Centre, 9 Batchelor Street, from 2pm. Bring the fabric you’d like your spats to be made from, along with the shoes you’re going to wear them with so we get the size right. There’ll be one sewing machine available; feel free to bring yours too if you can. Tea and coffee are available, and bring something to share for afternoon tea. A gold coin donation helps ensure we can keep using this venue.